You stock the cooler with snacks and beverages, pack the car until it nearly overflows and lather on sunscreen, all in preparation for a beach trip, where large crowds will make it hard to find a spot on the sand. Maybe a national park is more your style? There’s fresh air, the smell of trees and an opportunity to be one with nature. 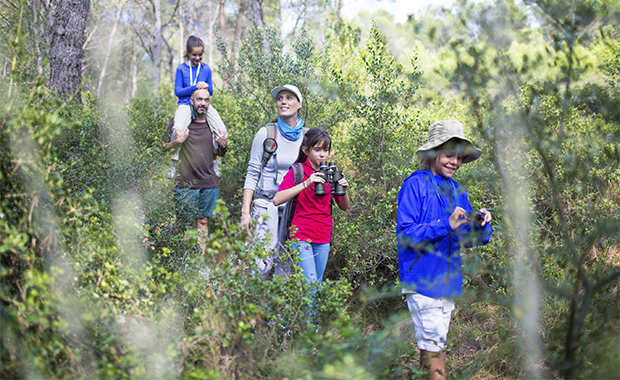 If you still need some convincing, here are seven reasons why your family should visit a national park for spring break. National parks are all over the country. Heck, there might even be one down the street from your house. OK, maybe not that close, but there are more than 400 registered national parks in the U.S.
You can visit a national park for one day or an entire week. Plus, it’s easy to sign up for a campground in online in advance, or if you’re just stopping by for the day, you can simply pay at entry. Every park has a personality; you just have to find one that’s right for your family. For example, the Great Smoky Mountains are more relaxing, while Denali is a bit more adventurous. But they both offer a wide variety of activities—swimming, hiking, fishing and more. It’s not only the parks themselves that are versatile, though. Should you and your family decide to go camping at a national park, there are different styles of camping (for example, tents vs. cabins) to match your family’s preferred comfort level. Compared to flight tickets, hotel stays and other typical spring break costs, visiting a national park can save your family some serious cash. Day prices can vary by national park, but to put it in perspective, an annual pass is only $80. Plus, all children 15 and under will be admitted free. Renting a campsite can be as cheap as $15 a night. Additionally, there’s a good chance you or someone close to you has some camping gear stored away, so you shouldn’t have to spend much in preparation for your trip either. We probably don't have to sell you on this—it’s nature. From the Grand Canyon to Old Faithful, national parks have some of the most coveted natural landmarks in the country. There are 76,000 archeological sites and nearly 2,500 national historic landmarks. National parks are also home to the most stunning landscapes in the country. The Redwood National Park in California has the tallest trees on Earth, and over 2,000 natural stone arches live at Arches National Park in Utah. Due to diverse landscapes, national parks are home to a plethora of wildlife that any animal-loving kid of yours will especially appreciate. Parks are also home to historical trails and ancient archaeological sites. So, while other kids will be lounging in the sand or sitting on the couch, your child will be soaking up history, science and more at a national park. The National Park Service has spent over 100 years protecting and preserving the biodiversity in the parks. They work to sustain and recover over 1,000 populations of endangered species. You can feel good as a parent knowing your child will learn about these conservation efforts and why they're important. What’s more, the money you spend goes directly to helping the National Park Services with these efforts. Too many spring break vacations are filled with technology and inactivity. Visiting a national park will give you and your kids a much-needed break from electronics. Not only will the variety of outdoor activities be good for your family’s mental health, but it will keep everyone physically active, too. About ready to pack your bags? Make sure to check out our Beginner's Guide to Family Camping.